Abdullah (may Allah be pleased with him) was the son of Abbas, an uncle of the noble Prophet (peace and blessings of Allah be upon him). He was born just three years before the Hijrah. When the Prophet (peace and blessings of Allah be upon him) passed away, Abdullah was thus only thirteen years old. When he was born, his mother took him to the blessed Prophet (peace and blessings of Allah be upon him) who put some of his saliva on the babe's tongue even before he began to suckle. This was the beginning of the close and intimate tie between Abdullah ibn Abbas (may Allah be pleased with him) and the Prophet (peace and blessings of Allah be upon him) that was to be part of a life-long love and devotion. When Abdullah reached the age of discretion, he attached himself to the service of the Prophet (peace and blessings of Allah be upon him). He would run to fetch water for him when he wanted to make wudu. During Salat, he would stand behind the Prophet (peace and blessings of Allah be upon him) in prayer and when the Prophet (peace and blessings of Allah be upon him) went on journeys or expeditions, he would follow next in line to him. Abdullah (may Allah be pleased with him) thus became like the shadow of the Prophet (peace and blessings of Allah be upon him), constantly in his company. In all these situations he was attentive and alert to whatever the Prophet (peace and blessings of Allah be upon him) did and said. His heart was enthusiastic and his young mind was pure and uncluttered, committing the Prophet (peace and blessings of Allah be upon him)'s words to memory with the capacity and accuracy of a recording instrument. In this way and through his constant researches later, as we shall see, Abdullah became one of the most learned companions of the Prophet (peace and blessings of Allah be upon him), preserving on behalf of later generations of Muslims, the priceless words of the Blessed Messenger of Allah. It is said that he committed to memory about one thousand six hundred and sixty (1660) sayings of the Prophet (peace and blessings of Allah be upon him) which are recorded and authenticated in the collections of al-Bukhari and Muslim. The Prophet (peace and blessings of Allah be upon him)would often draw Abdullah as a child close to him, pat him on the shoulder and pray: "O Lord, make him acquire a deep understanding of the religion of Islam and instruct him in the meaning and interpretation of things." There were many occasions thereafter when the blessed Prophet (peace and blessings of Allah be upon him) would repeat this dua or prayer for his cousin and before long Abdullah ibn Abbas realized that his life was to be devoted to the pursuit of learning and knowledge. Raising his hands to the heavens, the Prophet (peace and blessings of Allah be upon him) then prayed: “O Lord, grant him wisdom." The Prophet (peace and blessings of Allah be upon him)'s prayer undoubtedly was granted for the young Abdullah (may Allah be pleased with him) was to prove time and again that he possessed a wisdom beyond his years. But it was a wisdom that came only with devotion and the dogged pursuit of knowledge both during the Prophet (peace and blessings of Allah be upon him)'s lifetime and after his death. During the lifetime of the Prophet (peace and blessings of Allah be upon him), Abdullah would not miss any of his assemblies and he would commit to memory whatever he said. After the Prophet (peace and blessings of Allah be upon him) passed away, he would take care to go to as many companions as possible especially those who knew the Prophet (peace and blessings of Allah be upon him) longer and learn from them what the Prophet (peace and blessings of Allah be upon him) had taught them. Whenever he heard that someone knew a hadith (saying) of the Prophet (peace and blessings of Allah be upon him) which he did not know he would go quickly to him and record it. He would subject whatever he heard to close scrutiny and check it against other reports. He would go to as many as thirty companions to verify a single matter. Abdullah (may Allah be pleased with him) described what he once did on hearing that a companion of the Prophet (peace and blessings of Allah be upon him) knew a hadith unknown to him: "I went to him during the time of the afternoon siesta and spread my cloak in front of his door. The wind blew dust on me (as I sat waiting for him). If I wished, I could have sought his permission to enter and he would certainly have given me permission. But I preferred to wait on him so that he could be completely refreshed. Coming out of his house and seeing me in that condition he said: 'O cousin of the Prophet (peace and blessings of Allah be upon him)! What's the matter with you? If you had sent for me I would have come to you.' 'I am the one who should come to you, for knowledge is sought, it does not just come,' I said. I asked him about the hadith and learnt from him." In this way, the dedicated Abdullah (may Allah be pleased with him) would ask, and ask, and go on asking. And he would sift and scrutinize the information he had collected with his keen and meticulous mind. It was not only in the collection of hadith that Abdullah (may Allah be pleased with him) specialized. He devoted himself to acquiring knowledge in a wide variety of fields. He had a special admiration for persons like Zayd ibn Thabit (may Allah be pleased with him), the recorder of the revelation, the leading judge and jurist consult in Madinah, an expert in the laws of inheritance and in reading the Quran. 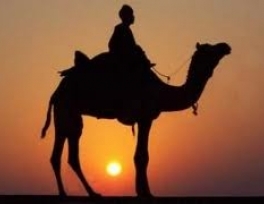 When Zayd intended to go on a trip, the young Abdullah (may Allah be pleased with him) would stand humbly at his side and taking hold of the reins of his mount would adopt the attitude of a humble servant in the presence of his master. Zayd would say to him: "Don't, O cousin of the Prophet (peace and blessings of Allah be upon him)." "Thus we were commanded to treat the learned ones among us,"Abdullah (may Allah be pleased with him) would say. "And Zayd (may Allah be pleased with him) would say to him in turn: "Let me see your hand." Abdullah (may Allah be pleased with him) would stretch out his hand. Zayd (may Allah be pleased with him), taking it, would kiss it and say: "Thus we were commanded to treat the ahl al-bayt members of the household of the Prophet (peace and blessings of Allah be upon him)"
As Abdullah's (may Allah be pleased with him) knowledge grew, he grew in stature. Masruq ibn al Ajda (may Allah be pleased with him) said of him: "Whenever I saw Ibn Abbas, I would say: He is the most handsome of men. When he spoke, I would say: He is the most eloquent of men. And when he held a conversation, I would say: He is the most knowledgeable of men." The Khalifah Umar ibn al-Khattab (may Allah be pleased with him)often sought his advice on important matters of state and described him as "the young man of maturity". Sad ibn abi Waqqas (may Allah be pleased with him) described him with these words: "I have never seen someone who was quicker in understanding, who had more knowledge and greater wisdom than Ibn Abbas. I have seen Umar summon him to discuss difficult problems in the presence of veterans of Badr from among the Muhajirin and Ansar. Ibn Abbas would speak and Umar would not disregard what he had to say." It is these qualities which resulted in Abdullah ibn Abbas (may Allah be pleased with him) being known as "the learned man of this Ummah". Abdullah ibn Abbas (may Allah be pleased with him) was not content to accumulate knowledge. He felt he had a duty to the ummah to educate those in search of knowledge and the general masses of the Muslim community. He turned to teaching and his house became a university - yes, a university in the full sense of the word, a university with specialized teaching but with the difference that there was only one teacher Abdullah ibn Abbas (may Allah be pleased with him). Then to me he (may Allah be pleased with him) said: 'Go out and say: Who wants to ask about the Quran and its interpretation, let him enter'. Again the house was filled and Abdullah (may Allah be pleased with him) elucidated and provided more information than what was requested." To avoid congestion with many groups of people coming to discuss various subjects on a single day, Abdullah decided to devote one day exclusively for a particular discipline. On one day, only the exegesis of the Quran would be taught while on another day only fiqh (jurisprudence). The maghazi or campaigns of the Prophet (peace and blessings of Allah be upon him), poetry, Arab history before Islam were each allocated a special day. Abdullah ibn Abbas (may Allah be pleased with him) brought to his teaching a powerful memory and a formidable intellect. His explanations were precise, clear and logical. His arguments were persuasive and supported by pertinent textual evidence and historical facts. One occasion, when his formidable powers of persuasion were used, was during the caliphate of Ali ibn Talib (may Allah be pleased with him). A large number of supporters of Ali in his stand against Muawiyah had just deserted him. Abdullah ibn Abbas (may Allah be pleased with him) went to Ali and requested permission to speak to them. Ali (may Allah be pleased with him) hesitated fearing that Abdullah would be in danger at their hands but eventually gave way on Abdullah's optimism that nothing untoward would happen. Abdullah (may Allah be pleased with him) went over to the group. They were absorbed in worship. Some were not willing to let him speak but others were prepared to give him a hearing. "Tell me"asked Abdullah (may Allah be pleased with him), "what grievances have you against the cousin of the Prophet (peace and blessings of Allah be upon him), the husband of his daughter and the first of those who believed in him?" "The men proceeded to relate three main complaints against Ali (may Allah be pleased with him). First, that he appointed men to pass judgment in matters pertaining to the religion of Allah - meaning that Ali had agreed to accept the arbitration of Abu Musa al-Asbari and Amr ibn al-As in the dispute with Muawiyah. Secondly, that he fought and did not take booty nor prisoners of war. Thirdly, that he did not insist on the title of Amir al-Muminin during the arbitration process although the Muslims had pledged allegiance to him and he was their legitimate amir. To them this was obviously a sign of weakness and a sign that Ali (may Allah be pleased with him) was prepared to bring his legitimate position as Amir al-Muminin into disrepute. In reply, Abdullah asked them that should he cite verses from the Quran and sayings of the Prophet (peace and blessings of Allah be upon him) to which they had no objection and which related to their criticisms, would they be prepared to change their position. They replied that they would and Abdullah proceeded: "Regarding your statement that Ali has appointed men to pass judgment in matters pertaining to Allah's religion, Allah Glorified and Exalted is He, says: 'O you who believe! Do not kill game while in the sacred precincts or in pilgrim garb. If any of you do so intentionally, the compensation is an offering, of a sacrificial animal equivalent to the one he killed and adjudged by two just men among." (Quran 5:95) "I adjure you, by God! Is the adjudication by men in matters pertaining to the preservation of their blood and their lives and making peace between them more deserving of attention than adjudication over a rabbit whose value is only a quarter of a dirham?" "Have we then finished with this point?" asked Abdullah (may Allah be pleased with him), and their reply was: "Allahumma, na’am - O Lord, yes!" Abdullah (may Allah be pleased with him), went on: "As for your statement that Ali fought and did not take prisoners of war as the Prophet (peace and blessings of Allah be upon him) did, do you really desire to take your "mother" Aishah as a captive and treat her as fair game in the way that captives are treated? If your answer is "Yes", then you have fallen into kufr (disbelief). And if you say that she is not your "mother", you would also have fallen into a state of kufr for Allah, Glorified and Exalted is He, has said: 'The Prophet (peace and blessings of Allah be upon him) is closer to the believers than their own selves and his wives are their mothers (entitled to respect and consideration).' (The Quran, Surah al-Ahzab, 34:6). "Choose for yourself what you want,"said Abdullah (may Allah be pleased with him), and then he asked: "Have we then finished with this point?" and this time too their reply was: "Allahumma, naam - O Lord, yes!" Abdullah (may Allah be pleased with him), went on: "As for your statement that Ali has surrendered the title of Amir al-Muminin, (remember) that the Prophet himself, peace and blessings of God be on him, at the time of Hudaybiyyah, demanded that the mushrikin write in the truce which he concluded with them: 'This is what the Messenger of Allah has agreed...' and they retorted: 'If we believed that you were the Messenger of God we would not have blocked your way to the Kabah nor would we have fought you. Write instead: 'Muhammad the son of Abdullah.' The Prophet (peace and blessings of Allah be upon him) conceded their demand while saying: 'By Allah, I am the Messenger of Allah even if they reject me." At this point Abdullah ibn Abbas (may Allah be pleased with him), asked the dissidents: "Have we then finished with this point? and their reply was once again: "Allahumma, naam - O Lord, yes!" One of the fruits of this verbal challenge in which Abdullah (may Allah be pleased with him) displayed his intimate knowledge of the Quran and the sirah of the Prophet (peace and blessings of Allah be upon him) as well as his remarkable powers of argument and persuasion, was that the majority, about twenty thousand men, returned to the ranks of Ali (may Allah be pleased with him). About four thousand however remained obdurate. These latter came to be known as Kharijites. He (may Allah be pleased with him), had a genuine and abiding concern for people. He genuine was thoughtful and caring. He genuine once said: "When I realize the importance of a verse of Allah's Book, I would wish that all people should know what I know. When I hear of a Muslim ruler who deals equitably and rules justly, I am happy on his account and I pray for him... When I hear of rains which fall on the land of Muslims, that fills me with happiness..."
Abdullah ibn Abbas (may Allah be pleased with him) was constant in his devotions. He (may Allah be pleased with him kept voluntary fasts regularly and often stayed up at night in Prayer. He (may Allah be pleased with him) would weep while praying and reading the Quran. And when reciting verses dealing with death, resurrection and the life hereafter his voice would be heavy from deep sobbing.